JM Heaford, industry-leading supplier of mounting and proofing solutions for the tag and label, flexible packaging, corrugated and gravure markets, says its recently introduced multi-tasking Sleeve Productivity Station (SPS) has received a response beyond expectation from world markets. Following a soft launch in 2018, the solution is already installed on four continents and reflects the global drive towards improving efficiencies among companies of every size. Key to the success of the SPS is a controlled, measured and user-friendly mechanism, which requires minimal operator training. In demounting, plates and tape are “driven off” using a consistent, even force protecting against plate damage that can commonly occur in the demounting process. With plate costs conservatively estimated at €200 for a single standard-sized flexible packaging plate including material and imaging, this benefit is cited by customers as a significant incentive for investment. The returns are boosted further by improvements in employee wellbeing through eliminating the entirely manual process of plate/tape demounting and, with it, the risk of RSI. The innovative design of the Heaford SPS offers a further unique capability. 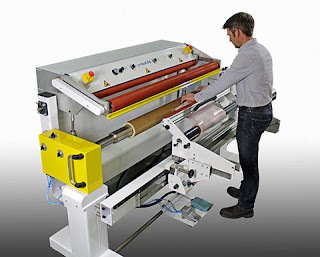 Due to its precision build featuring a sleeve mandrel that is customized to press specification the system can be used for accurate tape application. Using pressured laydown on the driven mandrel, tape is adhered onto the sleeves under a consistent pressure without air pockets or creases.